Finance Minister Arun Jaitley claimed credit, at the Vibrant Gujarat summit in Gandhinagar on 12 January 2015, for having halted “the reverse journey of investment leaving our shores and going outside” that he said had been occurred over the past 3-4 years. While such rhetoric may be understandable in the battle for public opinion, in terms of economic content it ranks right up there with Prime Minister Narendra Modi’s “empty coffers” claim last year i.e. it’s complete fiction. The beauty of a vague statement such as Jaitley’s is that it’s possible to interpret it in myriad ways. So let’s go through various possibilities. The chart above shows quite clearly that capital flows to India have been strong in recent years, peaking at US$92 billion in 2012-13 from a low of US$8 billion during the global financial crisis. So obviously Jaitley couldn’t have been referring to overall capital flows (which include foreign direct investment (FDI), portfolio flows and loans to Indian companies). Sadly for Jaitley, the data do not support this hypothesis either. Overall FDI flows have indeed dropped to the US$27-33 billion range per year after peaking at US$42 billion in 2008-09, but that is not even close to a “reverse flow of capital”. Perhaps he meant outward FDI by Indian businesses fleeing their troubled motherland? Unfortunately, the evidence doesn’t agree with this hypothesis either: outward Indian FDI has been anaemic for the last 2-3 years in both absolute and percentage terms. 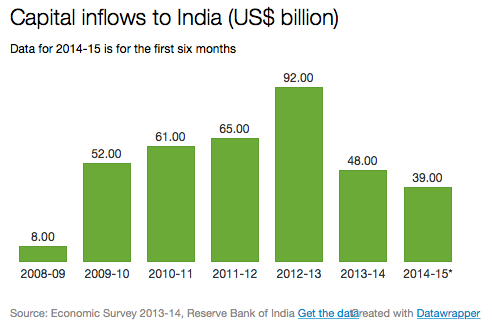 But surely India would have attracted stronger inflows were it not for the UPA’s terrible policies? While this is a reasonable question, note that we are now in the realm of counterfactuals, and quite far from any claims about “reverse flows”. The short answer? 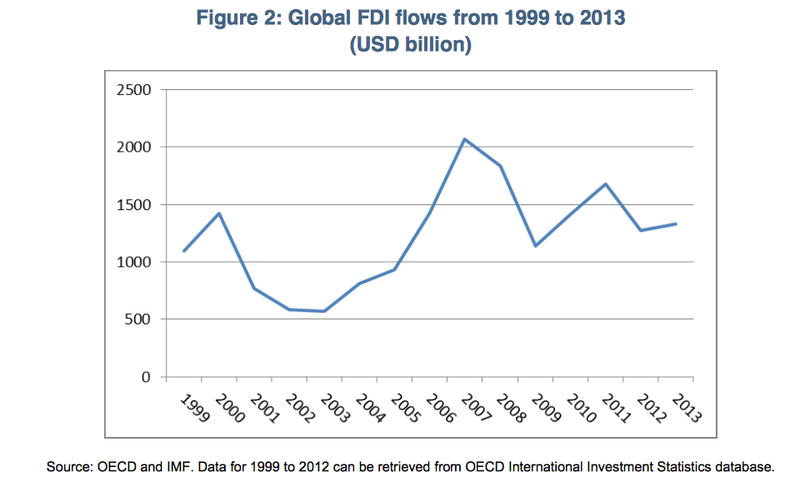 The chart above displaying FDI flows to India closely tracks the one below that shows global FDI flows. Those flows peaked in 2007 and 2008, and had a bump around 2011 before flattening. 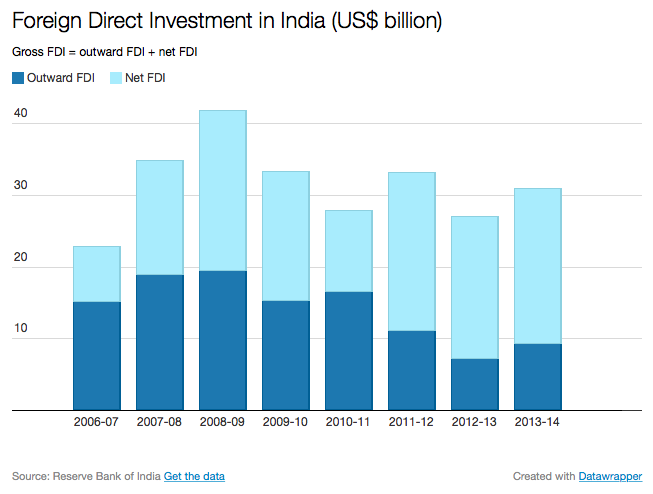 It would seem that domestic factors had little to do with the volume of FDI entering India.